There’s a bit of a risk involved in seeing a show you’ve been involved with yourself. 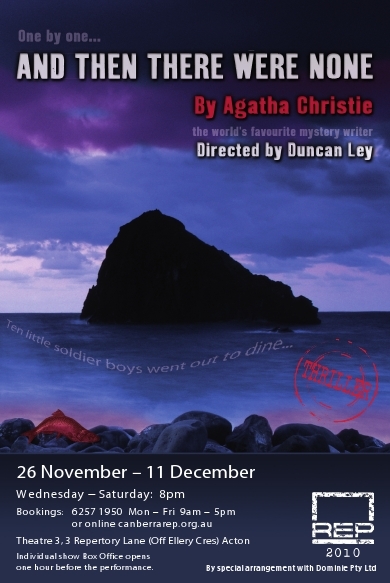 I did sound for a production of And Then There Were None in Theatre 3 back in 1998, when I first moved to Canberra, so there was no way I was going to miss seeing Rep’s production of it this year! One thing that surprised me was how many lines I recalled. I had none previously, although there were plenty of cues. Still, you wouldn’t think I would recall them twelve years later with no contact with the play in the intervening years. And I really didn’t remember the outcome. Not a skerrick of it. At any rate, it was a trip down memory lane. The risk, of course, is that my view of the play is coloured by my memories of the production I was involved with. Not that they should be compared. I was involved with a student production by CADS (the defunct Canberra Amateur Dramatic Society), directed by relatively inexperienced directors, whereas Rep’s production boasted the very deft hand of Duncan Ley as well as a host of experienced Canberra actors. And it showed. This was a great show that gave the play a lot more life than ours did. And it’s needed with Agatha Christie‘s dialogue. It gave the odd nod to Film Noir, which at times was just a little too much at odds with the text, but more often suited it well. The set, as dark and gloomy as a stage set can be, didn’t seem to add much apart from making the Film Noir reference, but it suited the purpose and certainly gave room for the performers to die the most excellent deaths. I love a play that doesn’t take itself too seriously, and this is quite true of Rep’s production of And Then There Were None. Really, no Agatha Christie play can be taken too seriously; they get awfully dry awfully quickly otherwise. This production manages to hold the attention marvellously.